As singer-songwriter – and recent Nobel Prize winner – Bob Dylan, once said: The times, they are a-changin’. That’s certainly true in the forest sector where challenges such as globalization, climate change and societal demands have altered how we view, study and use the forest. As the forest industry changes to meet new and evolving demands, so too does the focus on forest education. Forest studies that once concentrated primarily on wood as a resource are now a rarity. Environmental sciences, environmental management, land use, agroforestry and forest science, plus traditional forestry studies are all among today’s educational mix for those with an interest in the woods. Part of the reasoning behind that change is because solutions to the challenges mentioned above call for holistic and cross-sectoral approaches. Those developments, in turn, have been reflected both in the labor market and in the demands of students for a greater diversity in subject matter, experiences and skills. 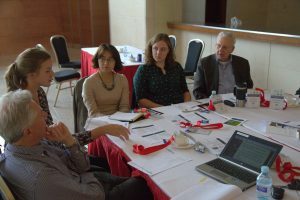 To strengthen multi-disciplinary research on forests and practices, a Joint Task Force has been established through a collaborative effort of IUFRO and the International Forestry Students’ Association (IFSA). “And we also want to provide a voice for youth in international forest policy processes,” said Lena Lackner, of Vienna’s University of Natural Resources and Life Sciences, who is the IFSA Coordinator of the Task Force . Over the past few decades there has been a troubling decline in the number of students enrolling in forestry schools. Some institutions have terminated their programs. “We hope that by broadening the scope of student activities and experiences and modernizing curricula to reflect the 21st Century environment, we will strengthen research capacity and also make forest education attractive to young people,” Ms. Lackner added. One of the products from the Task Force will be a “Higher Forest Education interactive tool.” (A beta version can currently be accessed at: http://www.gfis.net/gfis/education/.) Working with the Global Forest Information Service (GFIS), data will be available on global forest education activities and a list of forest faculties and programs worldwide. In addition to promoting forest education activities online, this initiative will also enhance students’ mobility. IUFRO and IFSA represent a similar field of interest at a global level and have a long history of cooperative work on educational matters. The Task Force on Forest Education is one of several established by IUFRO to advance knowledge under five research themes in accordance with the IUFRO 2015-19 Strategy. The five themes are: Forests, Soil and Water Interactions; Forests for People; Forests and Climate Change; Forests and Forest-based Products for a Greener Future; and Biodiversity, Ecosystem Services and Biological Invasions.